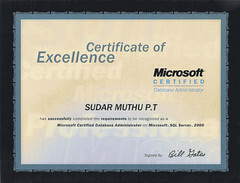 At last I have scanned and uploaded my Microsoft Certificates as promised. I have also created a photo set in Flickr. I have taken a really looong break after my last exam. So its time that I start studying again for exams and after much thought I have finally decided my next exam. It’s going to be SCJP (CX-310-035). The reason for choosing SCJP is that, for the next year or two I have to work mostly in java and will not be able to use much of .NET (at least at work). Currently Sun is giving a discount of 25% for the exam till 30th of June. But I don’t think I can take up the exam with 9 days. I have kept the third week of July as my target for this exam. Hope I meet it. BTW I am planning to use the book Sun Certified Programmer and Developer for Java 2 Study Guide (Exams 310-035 and 310-027) by OSBORNE. Does any one have a better suggestion..? I just received my MCAD Welcome Kit from Microsoft. It was nice to see my name printed in it as it was signed by Bill Gates. Sun Microsystems is celebrating Java Technologies 10th Birthday by giving a 25% discount on Java Technology Certification Exams. This offer is for a limited period from May 23, 2005 to June 30, 2005 and is available worldwide. More information about the offer can be found here. That’s a very good news for guys like me who want to take these exams as they are costly when compared with Microsoft Certification exams. Also Sun is introducing a new beta exam named SCJA (Sun Certified Java Associate). This exam targets Entry level java programmers with at least 6 months of experience. Even this exam is offered worldwide. For more details check out this page. In my previous post I mentioned that Microsoft’s offer is favoring my decision towards MCSD, but after seeing this offer will it shift to SCJP ? Microsoft’s Second-Shot exam offer, which was supposed to end by May 31st has been extended for another 3 months. The new deadline is August 31st. Exam retakes must be completed by September 30, 2005. The offer is available worldwide, but it can’t be combined with any other exam offer that requires a promotional code, including the MCP 2-for-1 exam offer or special offers in India. More details can be found at the details page.